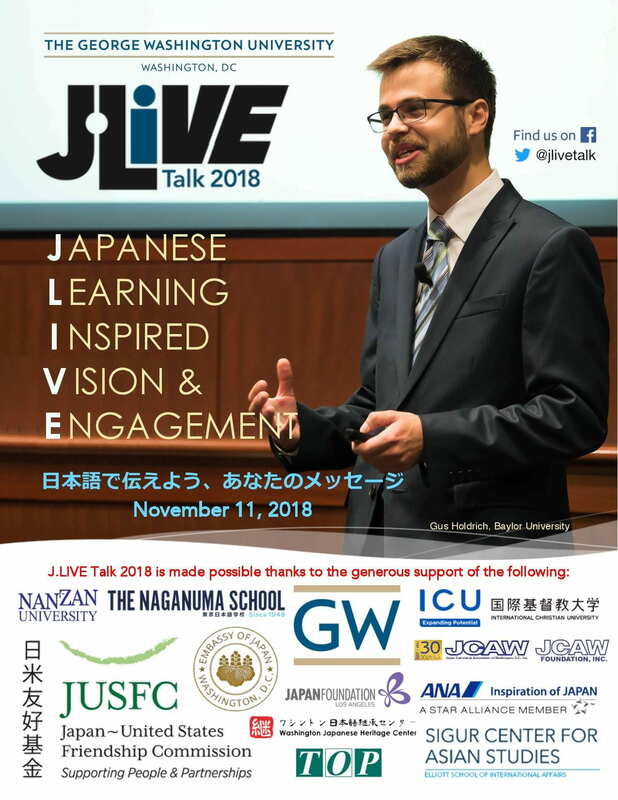 The George Washington University will host the fourth annual J.LIVE (Japanese Learning Inspired Vision and Engagement) Talk contest on November 11, 2018. The competition is open to students enrolled in Japanese language courses in colleges and universities across the nation, and the nine contestants who are coming to Washington, DC for the final round are selected through a preliminary round of video presentations. Prizes for the winners include airfare to Japan and tuition for summer language programs in Tokyo and Nagoya. The contest aims to promote the study of Japanese at the college and graduate school level in the US, and in doing so, help cultivate the next generation of leaders in US-Japan relations. Unlike a traditional speech contest, J.LIVE is a presentation contest geared for today’s global world. It emphasizes not just linguistic competence but also 21st century skills such as critical thinking, creativity, communication, and information/media/technology literacy. Contestants are thus evaluated for the effective use of data and the quality of their messages, as well as the dynamism and originality of their presentations which can include audio-visual materials, audience interaction, and other innovations. J.LIVE Talk is a national-scale, college and graduate-school level Japanese presentation contest. It is a nonprofit event administered by the Japanese program at The George Washington University on a voluntary basis. The event is supported by the Embassy of Japan, Japan-US Friendship Commission, All Nippon Airways, and other organizations and individuals who are committed to the goals of J.LIVE Talk. For more information, please visit www.jlivetalk.com .